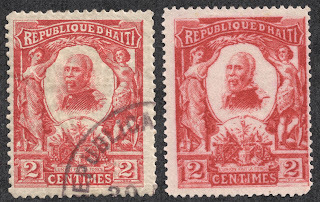 The Republic of Haiti shares the Caribbean island of Hispaniola with the Dominican Republic. 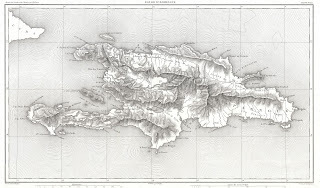 Haiti is located on the western side of the island. The capital is Port-au-Prince, and Haitian Creole and French are the official languages. The population was 3,000,000 in 1940. 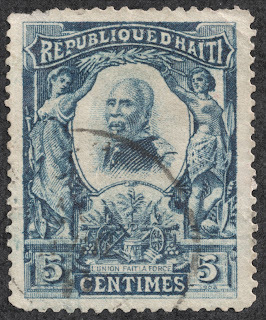 Haiti has been independent from France since 1804 after a slave revolt, and is the world's earliest republic lead by Blacks. 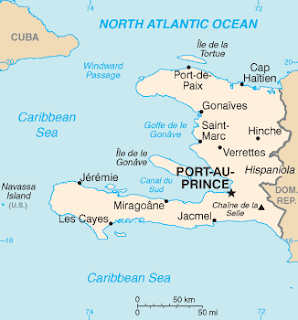 Haiti is also, with Canada, the only two independent nations in the Americas with French as an official language. Haiti is the poorest country in the western Hemisphere, with most Haitians living on less than $2/day. 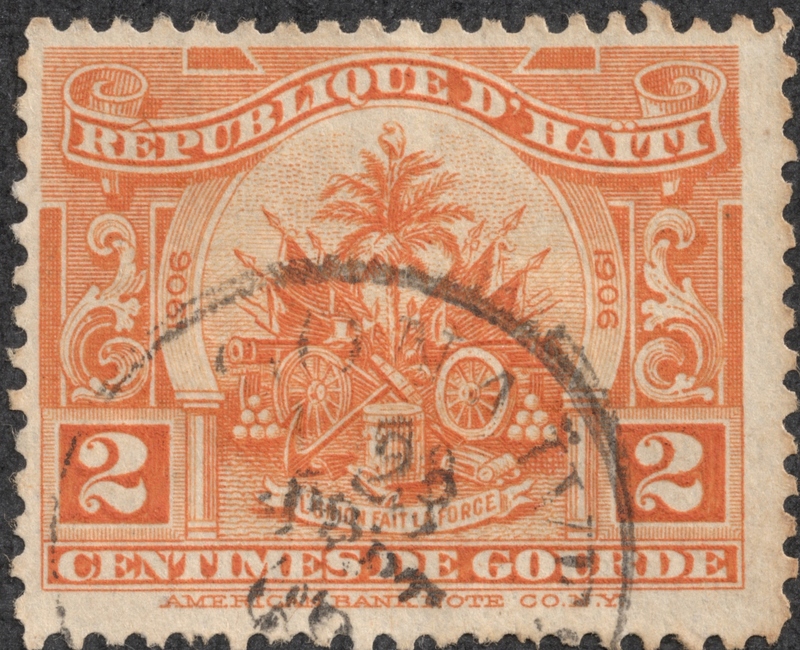 During its 200 year history, Haiti has had 32 coups. Haiti ranks first of all countries in perceived domestic corruption. 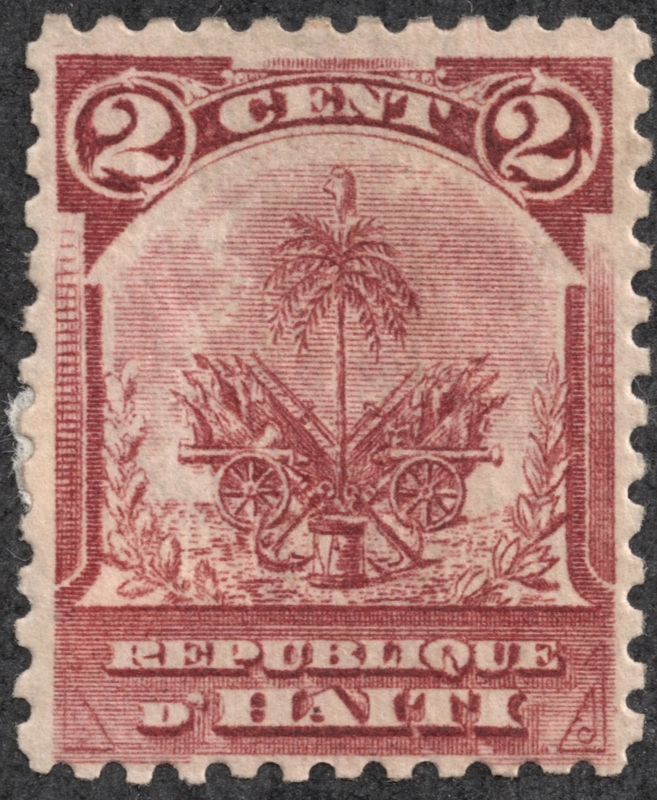 An effective Constitution introduced under Michel Domingue in 1874, lead to an improved government and the development of the sugar and rum industries. Michel Domingue's government peacefully transferred power to Lysius Salomon, one of Haiti's better leaders. 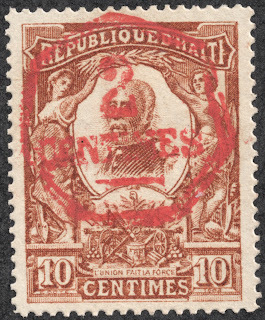 Stamps featuring the "Liberty Head" were issued in 1881, and stamps with Salomon's portrait appeared in 1887. But between 1911-1915, there were six different Presidents, all who were either killed or forced into exile. In 1915, the Dictator Vibrun Guillaume Sam massacred 167 political prisoners from elite families, and was subsequently beaten and killed by a mob in Port-au-Prince. Responding to the instability, and to the complaints of American banks to which Haiti was deeply in debt, the U.S. occupied the country. The occupation lasted until 1934. Reforms were carried out. 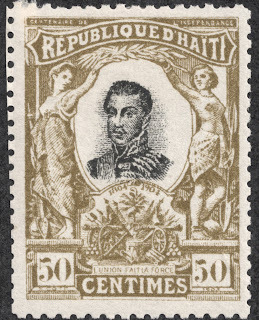 The President Philippe Sudré Dartiguenave signed a treaty that essentially made Haiti a U.S. protectorate. In 1922, Dartiguenave was replaced by Louis Borno. 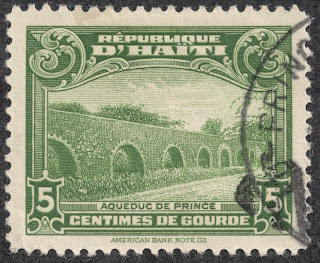 Infrastructure improvements were made, but many Haitians resented the loss of sovereignty. In 1930, Sténio Vincent, a critic of the occupation, was elected President, and the withdrawal began. 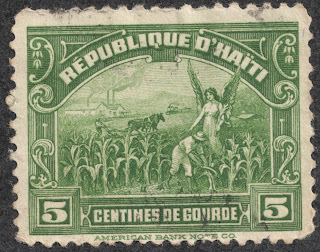 We will meet these and others on the stamps of Haiti. The 2011 Scott Classic Specialized catalogue has, from 1881-1940, 339 major stamp descriptions for the regular, semi-postal, air post, air post semi-postal, and postage due categories. Of those, 246 are <$1-$1+ (73%). 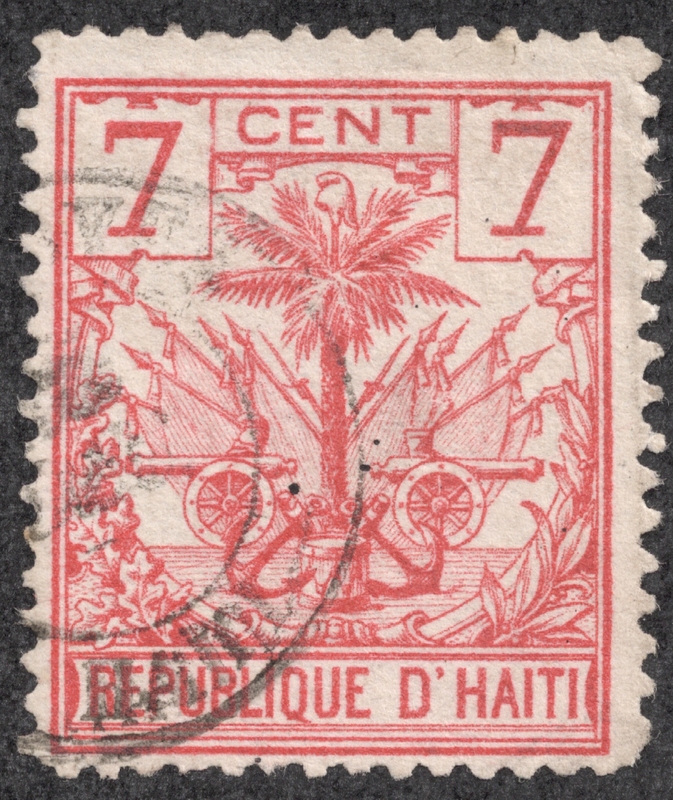 Clearly, Haitian stamps are quite affordable for the WW classical collector. 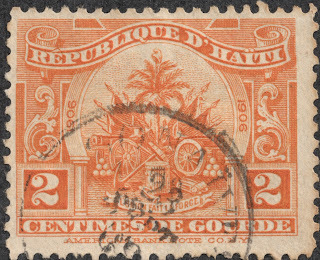 Although affordable, Haiti does have its share of forgeries, so caution is advised. The currency denominations are also a bit different than usual. 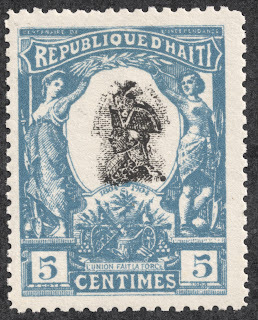 1881 Scott 5 7c deep blue/grayish "Liberty Head"
The inaugural issue for Haiti was a six stamp imperforate set with "Liberty Head" as the design. 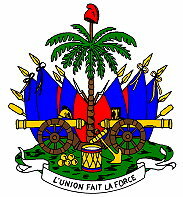 This was the first and last design that imitated the "French" model, as the rest of the issues for the next 25 years either had "Coat of Arms" or Presidents as the image. CV ranges from $4-$30. 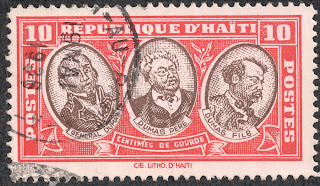 Beginning in 1882, a seven stamp perforated set was issued of the "Liberty Heads". The left 1c is an example. CV is $1+-$4+. 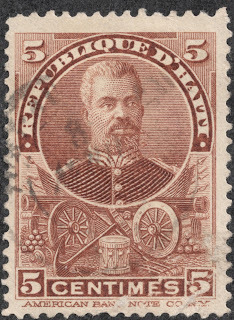 Then in 1886-87, a three stamp issue was produced that had some subtle changes in the design. 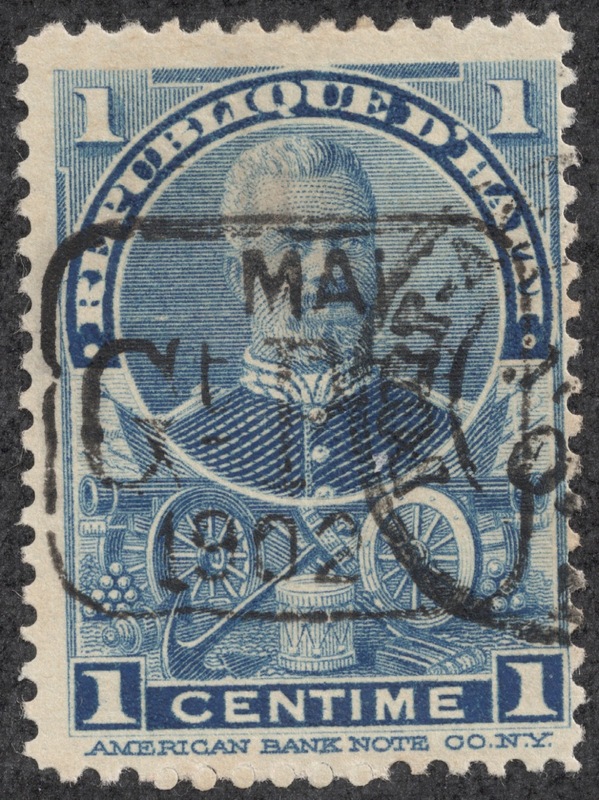 The blue arrow on the right 1c stamp points to the crossed lines of dots on the face. CV is $2-$7. 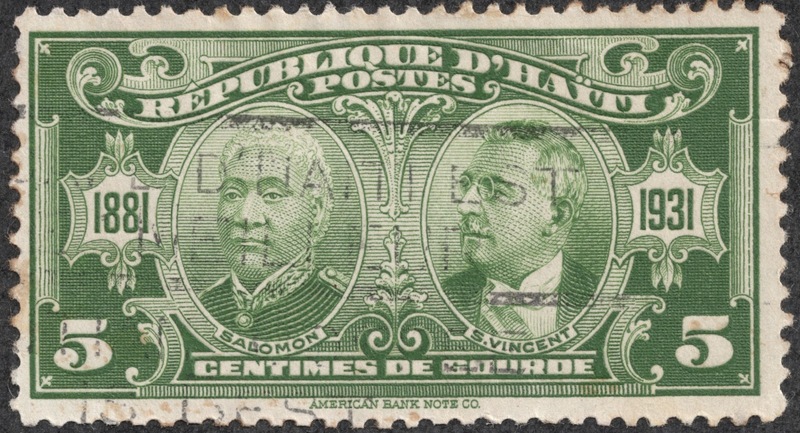 1887 Scott 24 5c green "Salomon"
A four stamp set (CV <$1) was issued in 1887 with the portrait of Lysius Salomon, president of Haiti from 1879-1888. 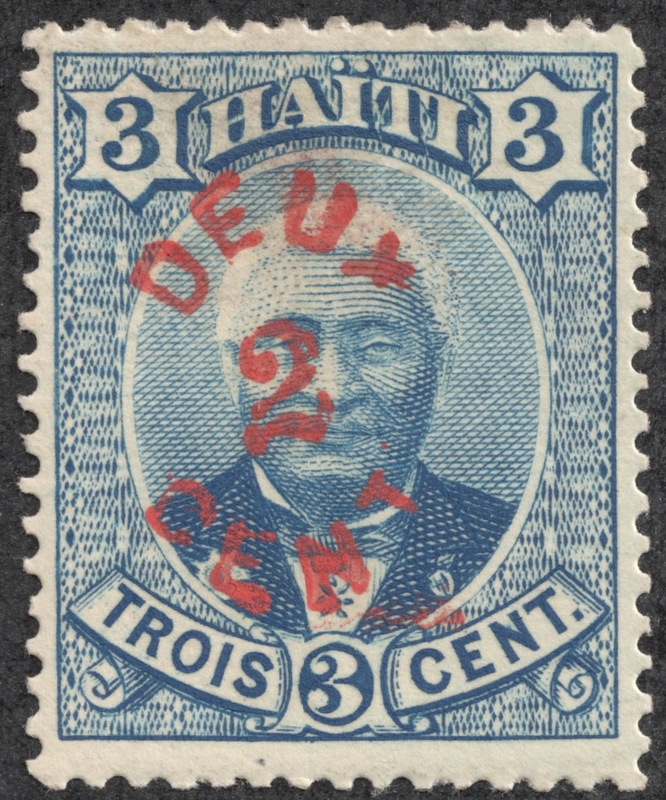 He was responsible for developing Haiti's postal system and joining the International Postal Union. 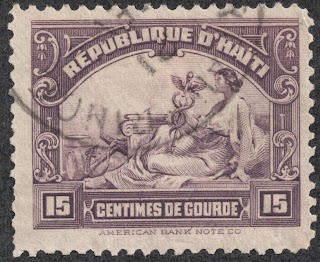 The first handstamped surcharged stamp for Haiti is shown above, to be followed over the years by many others. 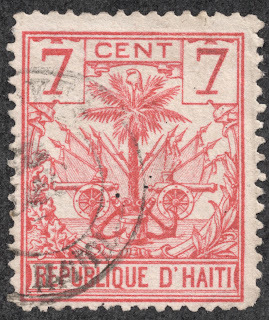 Missing letters are often found with many of Haiti's surcharged issues. 1891 Scott 30 7c red "Coat of Arms"
The first "Coat of Arms" issue was produced in 1891. This five stamp set has a CV of <$1-$2+. 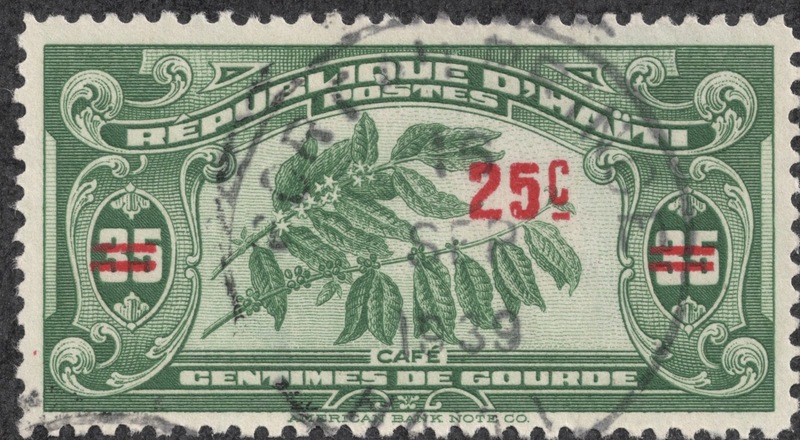 Note the leaves are raised in this issue, which is a distinguishing feature for these stamps. 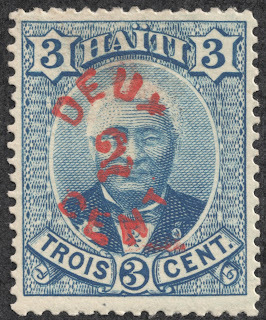 1892-95 Scott 33 2c deep blue "Coat of Arms"
Another "Coat of Arms" set was produced in 1896 with six stamps (CV <$1-$1+). 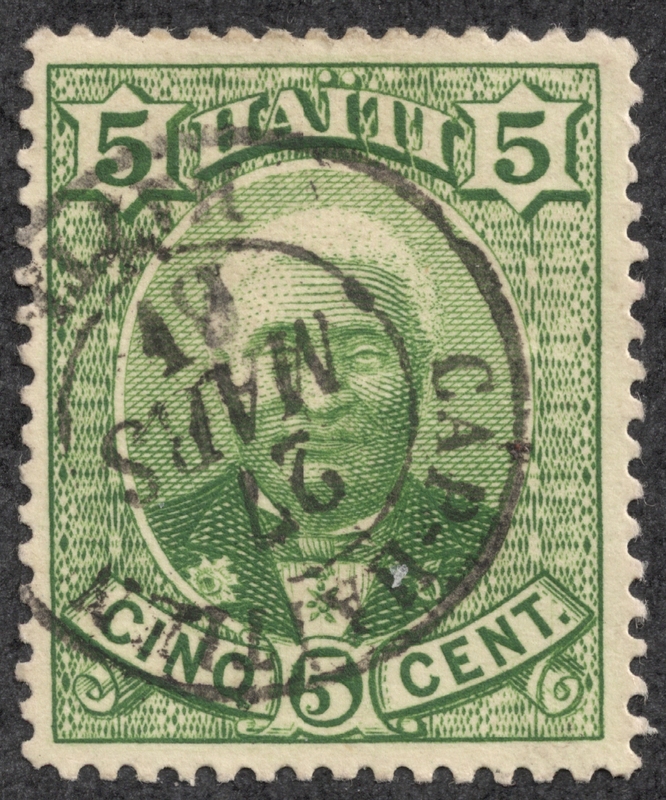 This set can readily be distinguished from the previous set by different color, perforation, printing differences, slightly different size, and the "c" of cent. Consult Scott for specifics. 1898 Scott 47 2c brown carmine "Coat of Arms"
The 1898 six stamp set had a watermark ( a reversed "R H"), and has a CV higher than the immediate preceding issues ( CV <$1-$10). The Phrygian cap above the palm tree is placed there as a symbol of freedom. There are three flags of the country draped on each side, and two cannons on a green lawn. On the lawn are items such as a drum, cannon balls, and an anchor. The motto on the ribbon (in English) says "Unity is Strength". 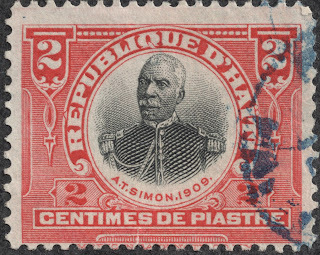 "President T. Augustin Simon Sam"
In 1898-99, a 15 stamp set was produced with two designs. CV for the stamps are <$1, save one. The "President Sam" design is found on eight stamps. He was president from 1896-1902. His cousin, Jean Vilbrun Guillaume Sam, also became president of Haiti. 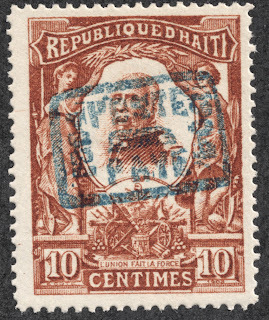 This might be a good time to tell the story of Jean Vilbrun Guillaume Sam, who was president from March to July 1915, but does not appear on any Haitian stamps. 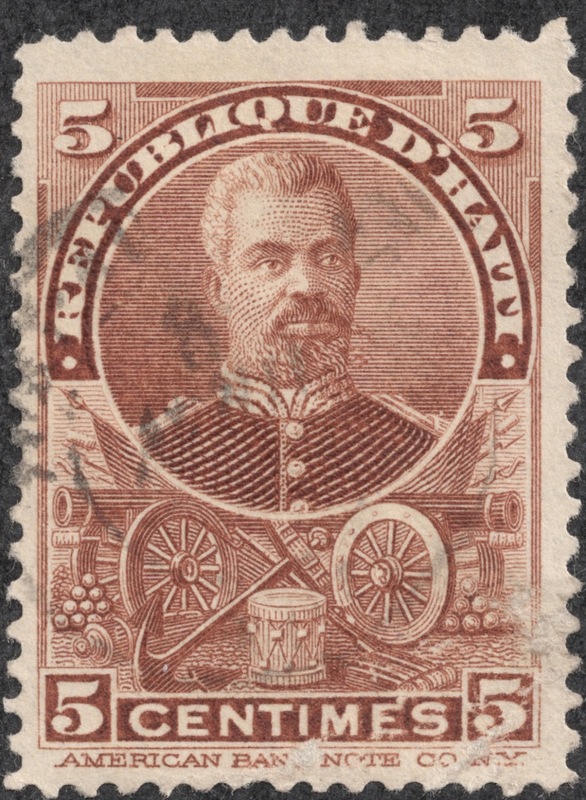 Sam lead the revolt that toppled President Oreste Zamor (Found on a 1914 stamp issue). Sam was eventually declared President, the fifth in five years. But Sam had his own revolt to contend with by forces opposing the strategic and commercial ties to the United States. The subsequent repressive measures by Sam included ordering the execution of 167 political prisoners, most well educated, and including former President Zamor. This infuriated the population, and a mob broke into the French embassy where he had received asylum. They beat him, threw his body over the iron fence, where the crowd ripped up the body and paraded the cadaver pieces throughout the capital. The country was in chaos. President Woodrow Wilson ordered American troops to seize the capital. The country was then occupied for nineteen years, until August, 1934. 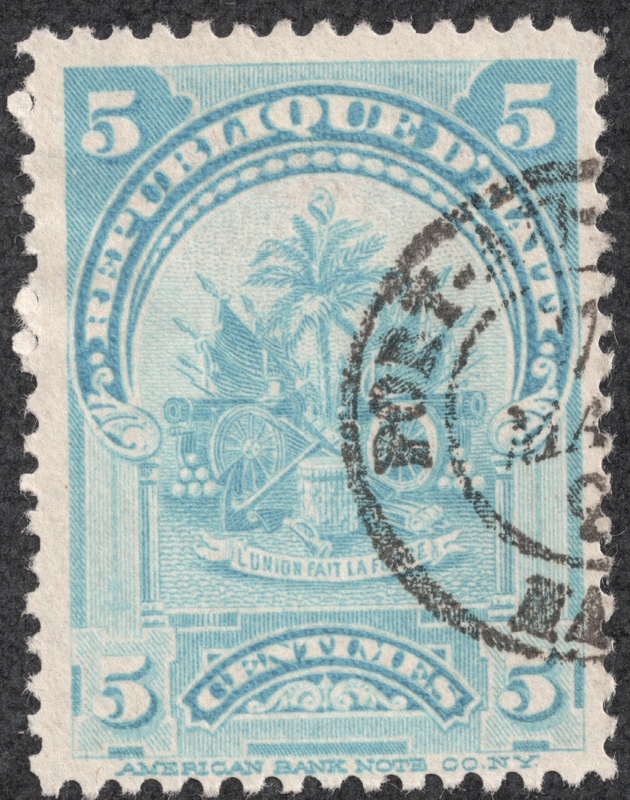 1899 Scott 59 5c pale blue "Coat of Arms"
The other design found on the 1898-99 issue, the "Coat of Arms", is shown above. This design is found on seven stamps. 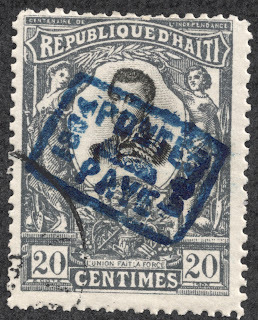 Notice the neat 'Port-au-Prince" cancellation? 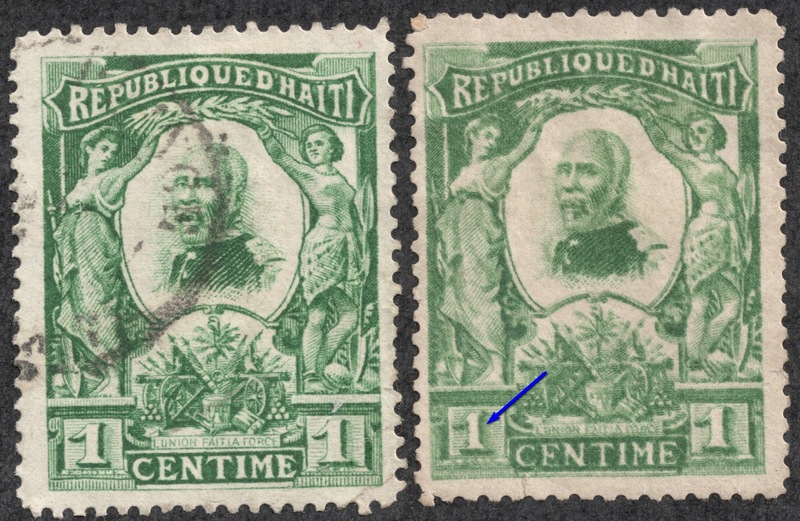 I suspect these are CTO's, as they are found on many of the Haitian stamps in my collection. 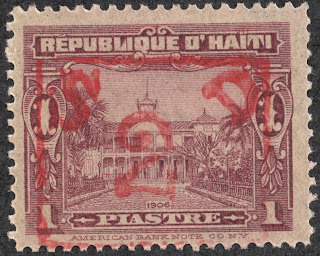 The 1898-99 issue was subsequently handstamped for a fifteen stamp set (CV <$1 for 10 stamps) in 1902. The handstamp has May, 1902 as the date. Scott notes that forgeries exist for this overprint. Look at the "neatly" placed cancel - a "probable" CTO. 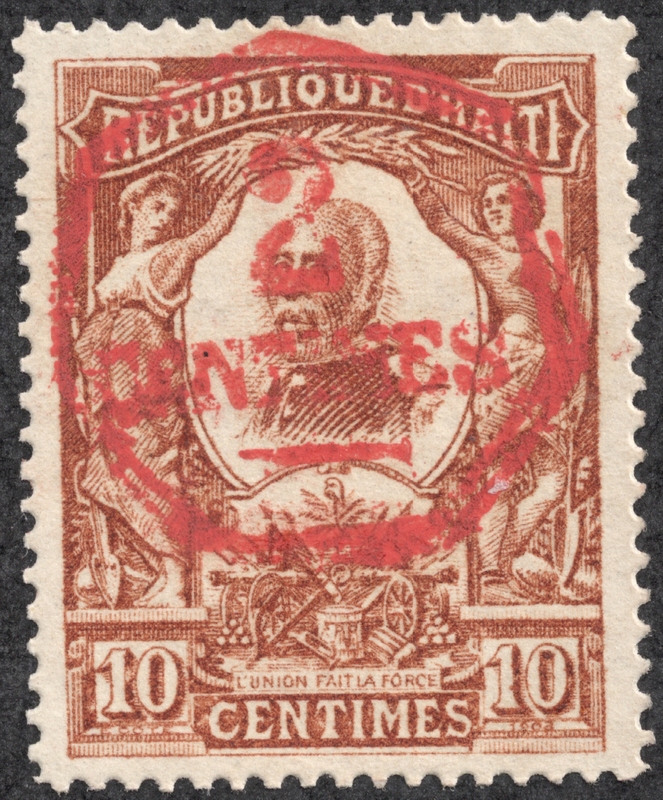 The "Centenary of Independence Issue" of 1903 consists of seven stamps (CV <$1). Besides the Coat of Arms design, they have a portrait of three revolutionary heroes. Pictured here is Toussaint L'Ouverture, the leader of the Haitian Revolution. His military victories lead to the independent black state of Haiti, consisting of former slaves who were now a self-governing people. But Napoleon Bonaparte sent forces in 1802, and exiled him to France, where he died in 1803. 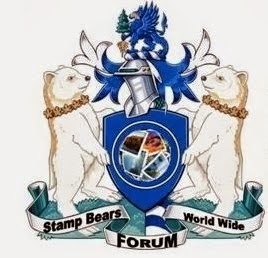 Let's say something about the stamps themselves. Unfortunately, most of the stamps in collections are forgeries. Stamps with perforation 13 1/2 are forgeries, which are most of the stamps in my collection. 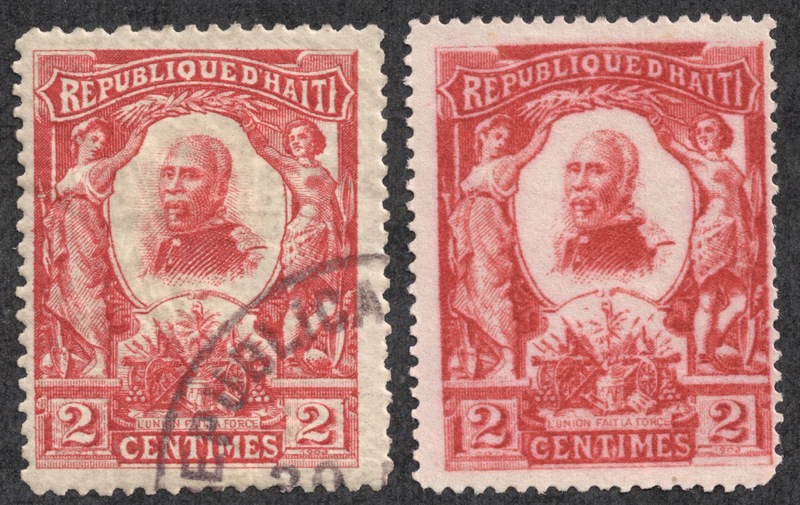 Perforation 14 and 13 1/4 are found on "real" stamps. The stamp above is perforation 14, so may be "real", but I would need to investigate further for that determination.
" 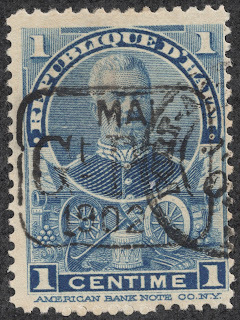 1903 Scott 84 5c dull blue & black"
Here is no doubt a forgery. 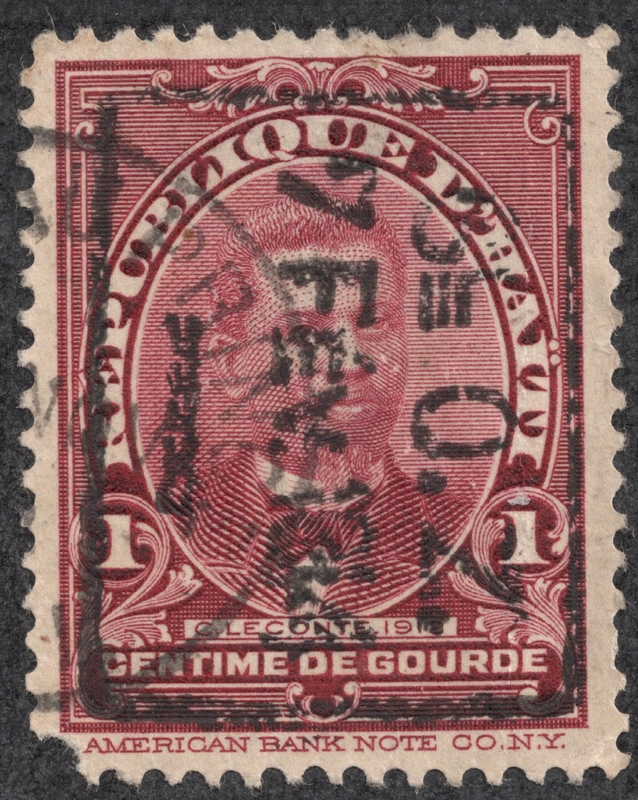 The perforation is 13 1/2 (forgery). The vignette portrait is crude (Compare to the stamp before this one). 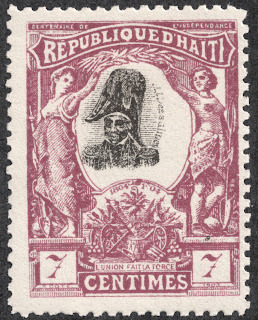 "1903 Scott 85 7c plum & black"
Jean-Jacques Dessalines was one of the leaders of the Haitian Revolution, and the first ruler of Haiti. He is considered the founding father. 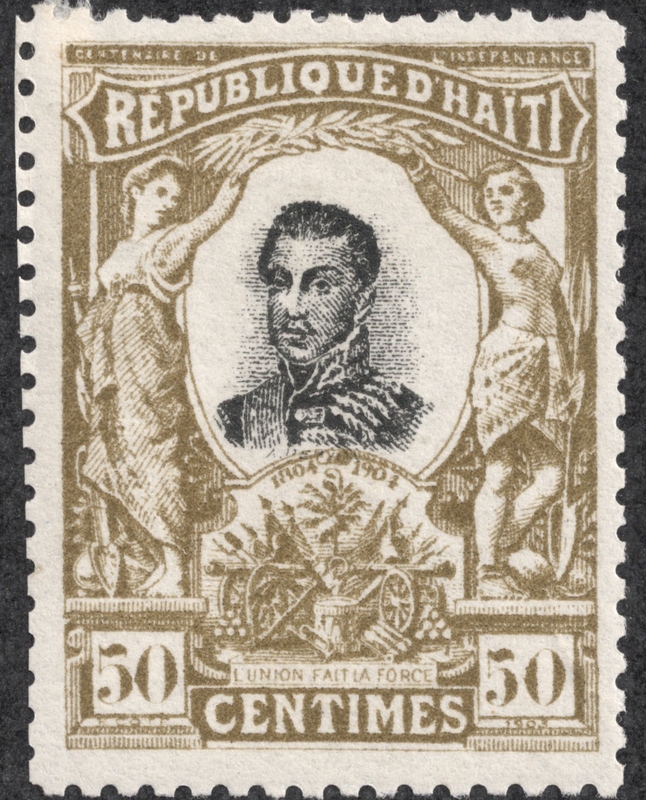 He named himself Emperor Jacques I of Haiti, and ruled from 1804-06, until he was assassinated. 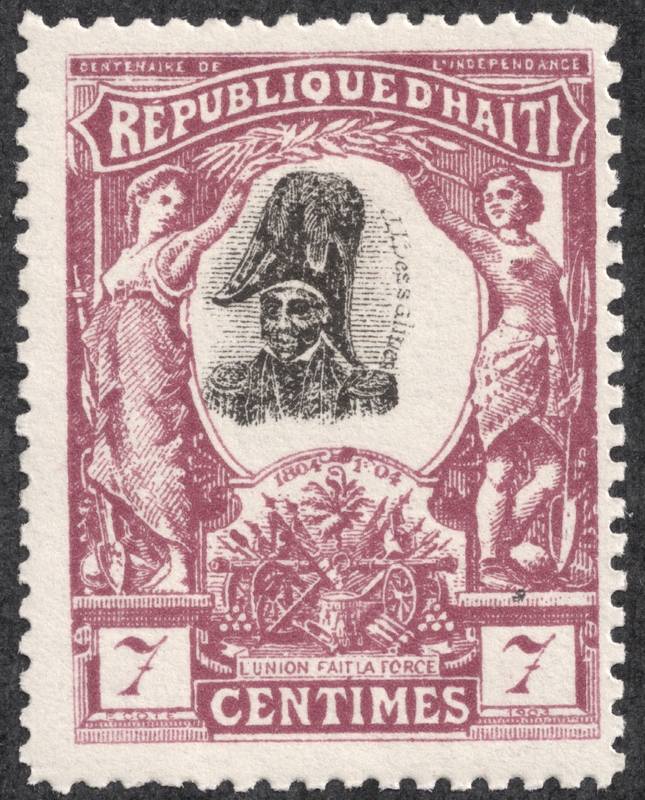 The national anthem of Haiti, La Dessalinienne, is named in his honor. 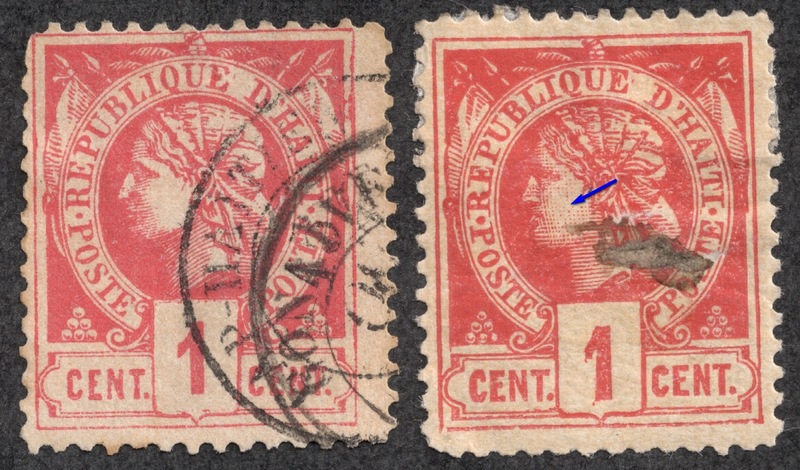 The Perforations are 13 1/2 (forgery). The vignette portrait is crude. 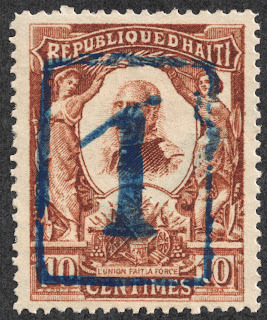 "1903 Scott 88 50c olive & black"
Alexandre Pétion, one of the founding fathers, was president of Haiti from 1806-1818. He appears on both the 20c and 50c denomination stamps. The stamp itself: a forgery. The perforation is 13 1/2 (forgery), and the vignette portrait appears crude. 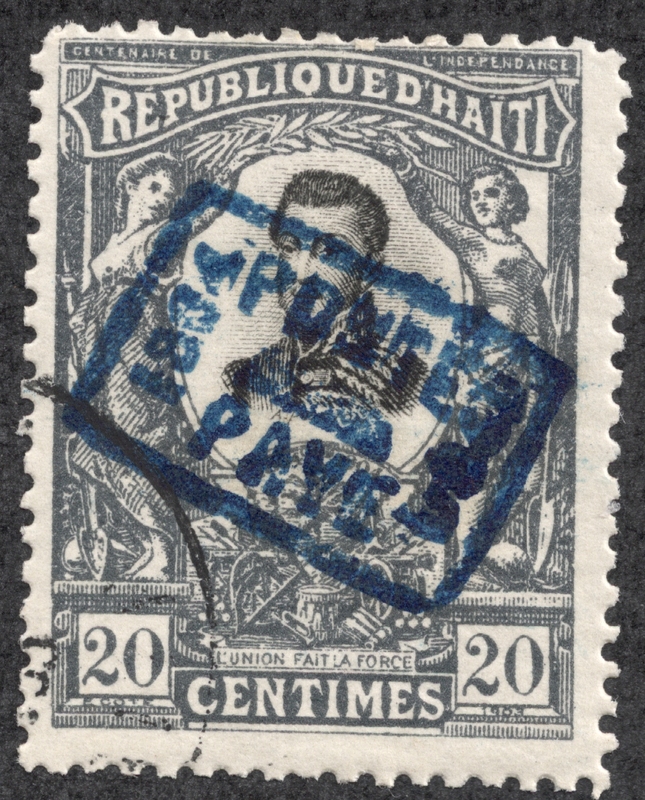 In 1904, the 1903 issue was handstamped as shown above. This seven stamp set has an individual CV of <$1. 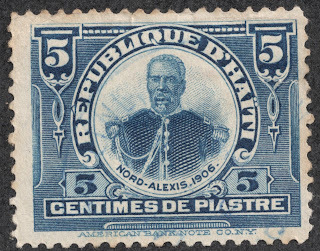 In 1904, a six stamps issue (CV <$1) was produced with the vignette portrait of President Pierre Nord Alexis. 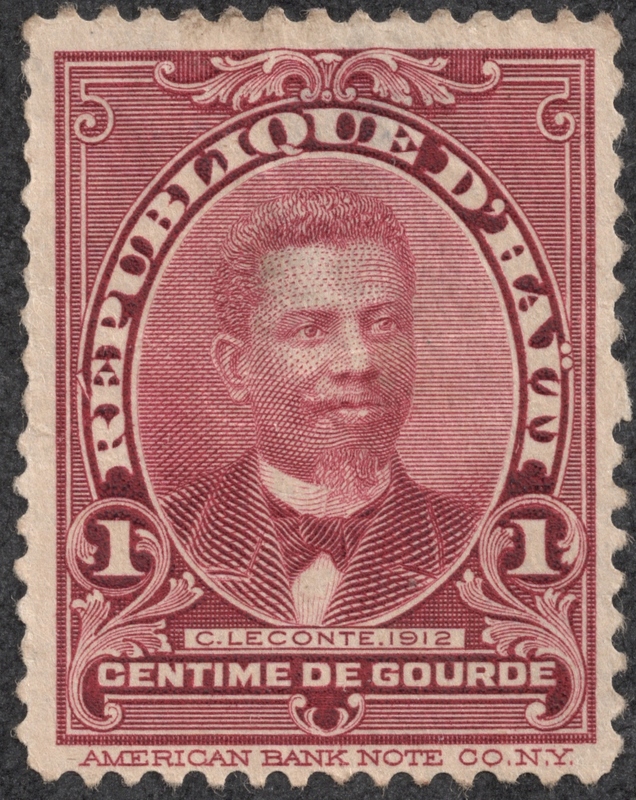 He was president of Haiti from 1902 to 1908. He became president by leading troops loyal to him into the country's Chamber of Deputies, and "inviting" the legislators to declare him president. He managed to hold on to the presidency for 6 years. His regime was rife with corruption. But in 1908, already in his eighties, he declared himself "President for Life". That was too much for the opposition, and he was exiled. He later relocated to New Orleans, and he died and was buried there in 1910. The stamps themselves? Rife with corruption. ;-) The originals are perforation 14 or 13 1/4. So other perforations, compound perforations, or perforation 13 1/2 are forgeries. 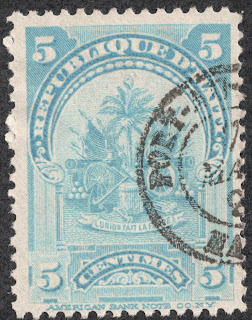 The stamp above is perforation 14, so may be original. But it is worse then that. The "Focus on Forgeries" handbook by Varrio Tyler states that reprints of all values were prepared from original plates. Some of the reprints are difficult to distinguish from the originals. Some of the reprints are in very bright colors on white paper, according to Scott. "1904 Scott 97 2c carmine"
The 2c carmine stamps in my collection are forgery reprints as noted above. But the right side stamp has a quite bright color, which, I believe, is the particular type of reprint that Scott mentions. So reprints from original plates can be forgeries, but are there "actual" forgeries? Varrio Tyler mentions the 1 centime and 50 centime stamps exists as actual forgeries. I have a reprint, that is probably from the original plate, as the perforations are not what one finds with the originals. That is illustrated on the left above. But the right stamp is an outright forgery, possibly from the Paris forger Louis Dumonteuil d'Olivera, according to Varrio Tyler. The outright forgery has the left lower "1" thinner (blue arrow), measuring .6-.7 mm across, while the original plate "1" measures .8 across. The original plate has "E-COTE" under the "1" in large type, touching the lines above and below it. The forgery "E COTE" is smaller, and without a hyphen (and in this case quite blurred). There are also other differences, especially noted in the letters. Also in 1904, the 1904 issue was handstamped as above (six stamps; CV <$1). Forgeries can be found. 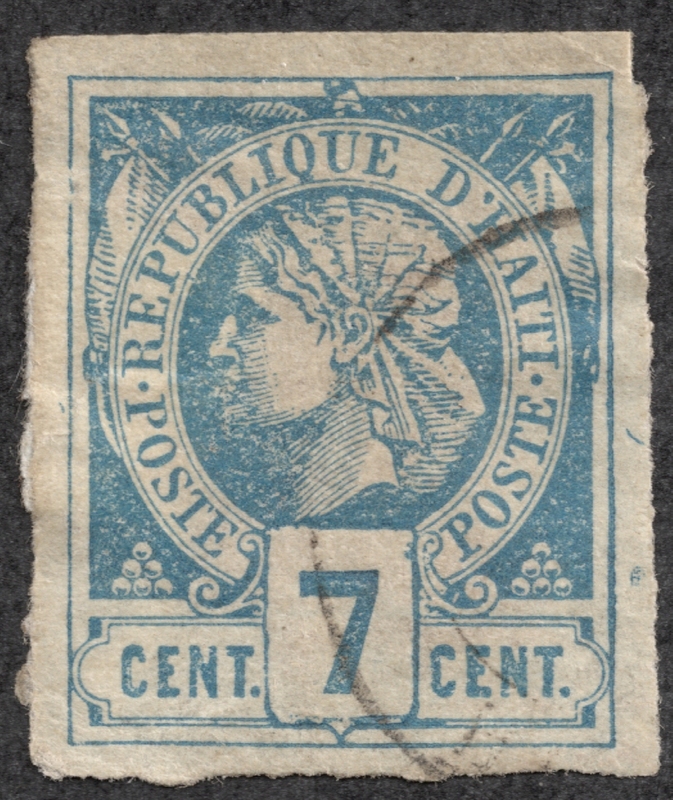 Since the perforation is 14 for this stamp, this example may very well be an original printing. 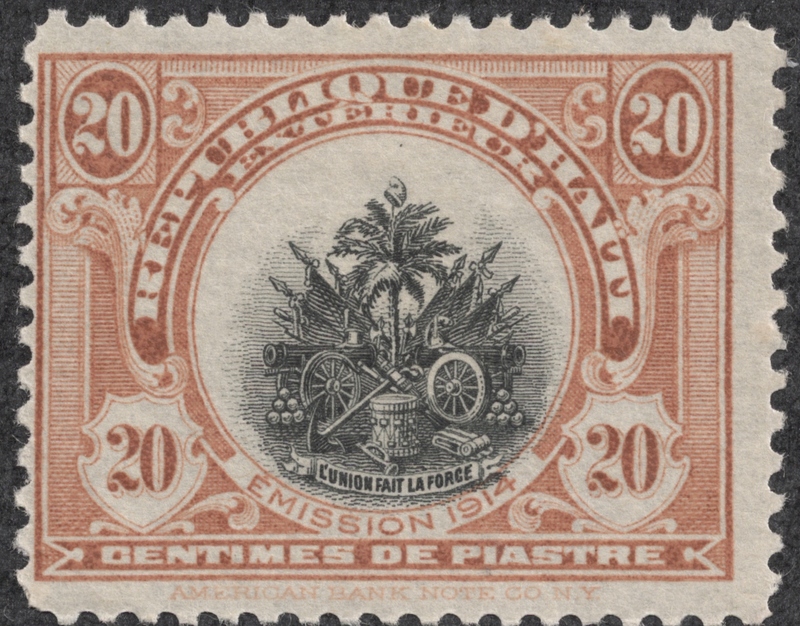 Between 1906-13, twenty stamps were released in denominations for foreign postage (centimes de piastre). The 1906 release of 12 stamps had a modest CV of <$1-$4+, mostly at the low end. But the later 1911-13 issue 8 stamps have a CV of $4+-$20+. 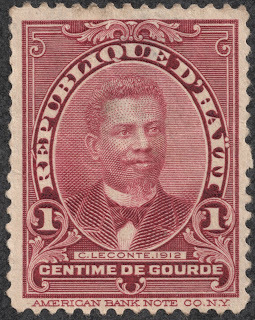 Also, 1906 saw the release of a 5 stamp set (CV <$1) for domestic postage valued in centimes de gourde. 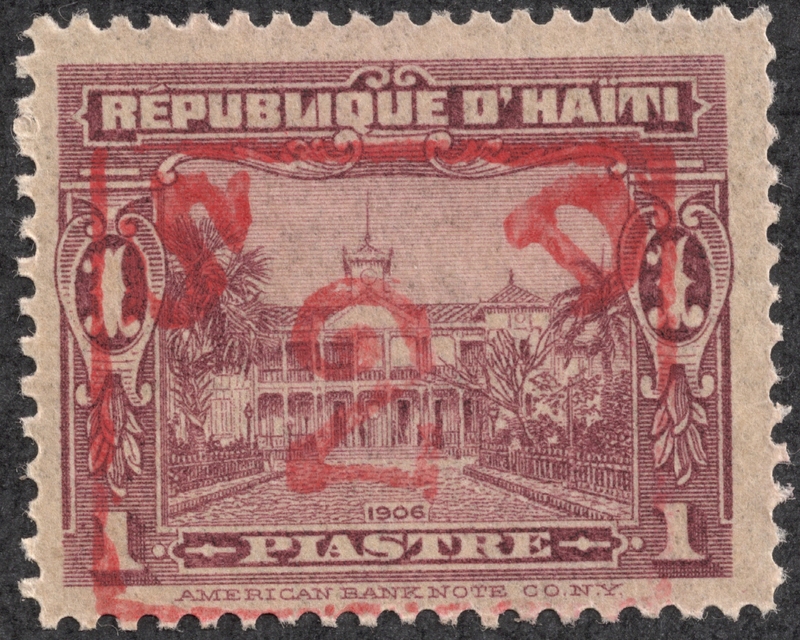 One should note that many of Haiti's stamps are produced by the American Bank Note Company of New York. 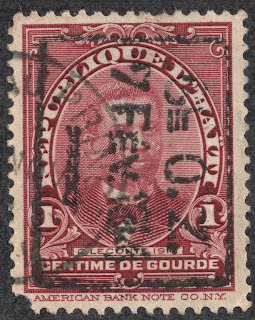 In 1907, the 1904 "Nord Alexis" issue was handstamped surcharged in red, black, brown, or violet. The twelve stamps mostly are CV <$1, but the violet surcharged stamp (1c on 20c orange) has a CV of $150. 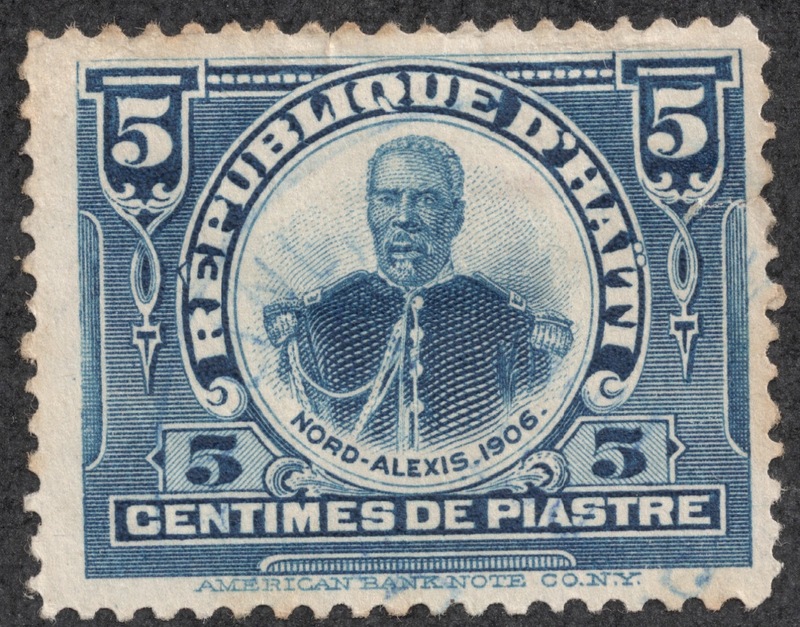 President Nord Alexis was exiled in 1908, so there was a need for a new presidential stamp. Antoine Simon lead the rebellion against Pierre Nord Alexis, and he subsequently became president from 1908-1911. He allowed exiled Haitians to return, and promoted road and railroad infrastructure building, and the electrification of Port-au-Prince. 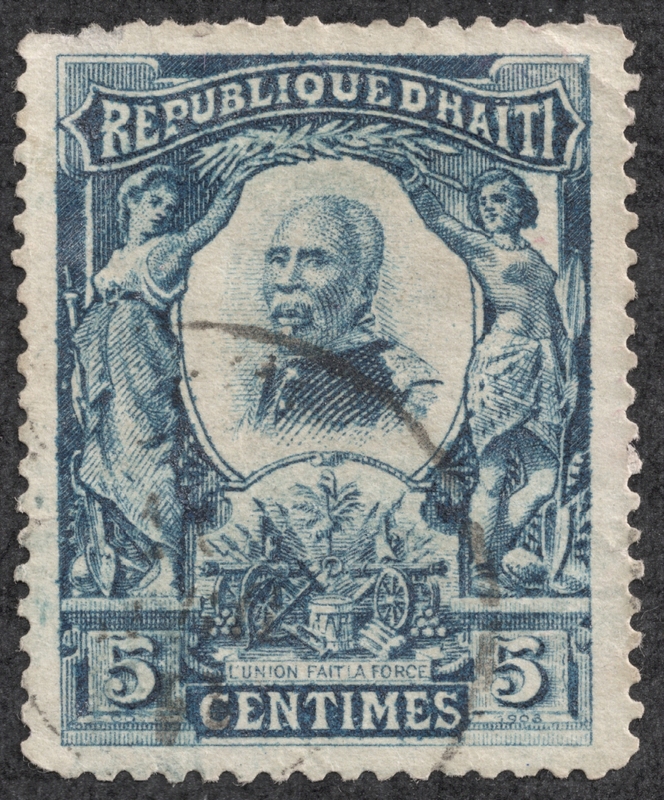 But Haitian companies were taxed to pay for the upgrades, which lead to unrest, and finally a coup d'état against Simon by General Cincinnatus Leconte. "President Simon's daughter Celestina was a voodoo priestess who famously married and divorced her sacred goat." 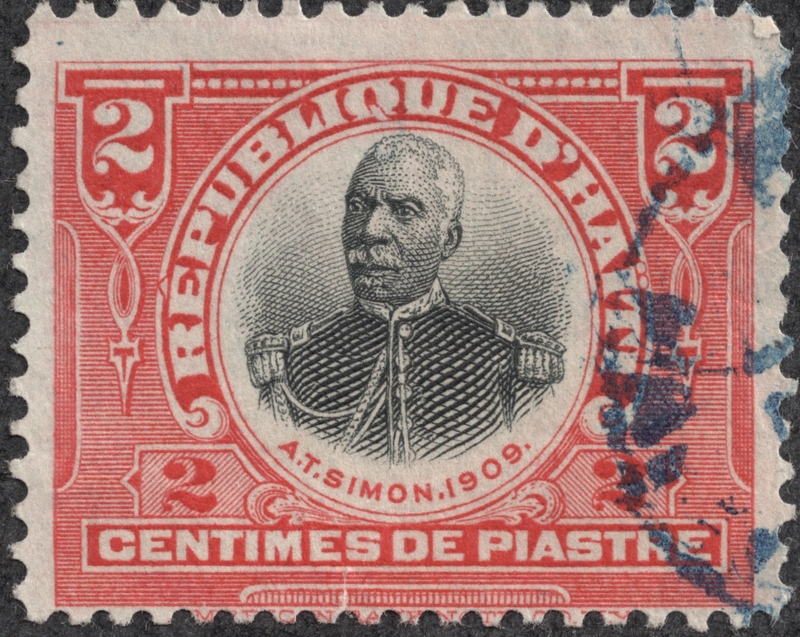 The 1910 "Simon" stamp issue consisted of three stamps for foreign postage, and one for domestic postage. CV is <$1-$7+. In turn, Cincinnatus Leconte became president after the coup in 1911 until August 8, 1912. He did manage to have a three stamp set (CV <$1) issued in 1912. He proceeded to pave streets, put up telephone lines, increase teacher pay, and run a cleaner tighter government. Curiously, he did pursue a discriminatory policy towards the "Syrian" population (actually Lebanese Christians). On August 8, 1912, a huge explosion destroyed the National Palace, killing Leconte and several hundred soldiers....or not, depending on which account one reads. Tancrede Auguste became the next president. In 1914, a whole group of stamps from preceding issues were handstamped with the February 7, 1914 date, and some were surcharged. Altogether, 38 stamps were handstamped with 27 stamps having a CV of <$1-$2+. August 8, 1912: After the death of President Leconte, the Constituent Assembly appoints Tancrede Auguste president. 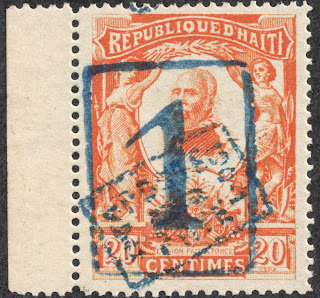 1913: President Auguste dies during a visit to northern Haiti. (Some sources believe he was a victim of poisoning.) Senator Michel Oreste is elected president by the Constituent Assembly. 1914: President Oreste is overthrown and succeeded by Oreste Zamor. President Zamor is overthrown and succeeded by Joseph Davilmar Théodore. July 28, 1915: 3000 U.S. marines enter Port-au-Prince, beginning a nineteen year U.S. occupation. August 12, 1915: Senator Philippe Sudré Dartiguenave is elected by the Constituent Assembly to a seven year term as president. 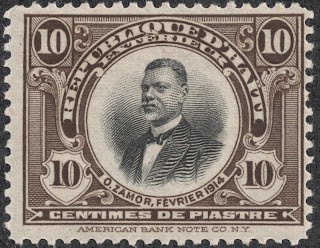 1914 (Scott 226) 10c de p black brown & black"Oreste Zamor"
In 1914, a 10 stamp issue was produced, but a large quantity was stolen during transit. The stamps were never placed on sale at post offices according to Scott. Although the stamps are in the 1947 Scott catalogue (Scott 219,221,223,224,226,227,228,230,231,232), the numbers are gone in the 2011 Scott Classic, although Scott does illustrate the designs and puts a value of $8+ for the set. 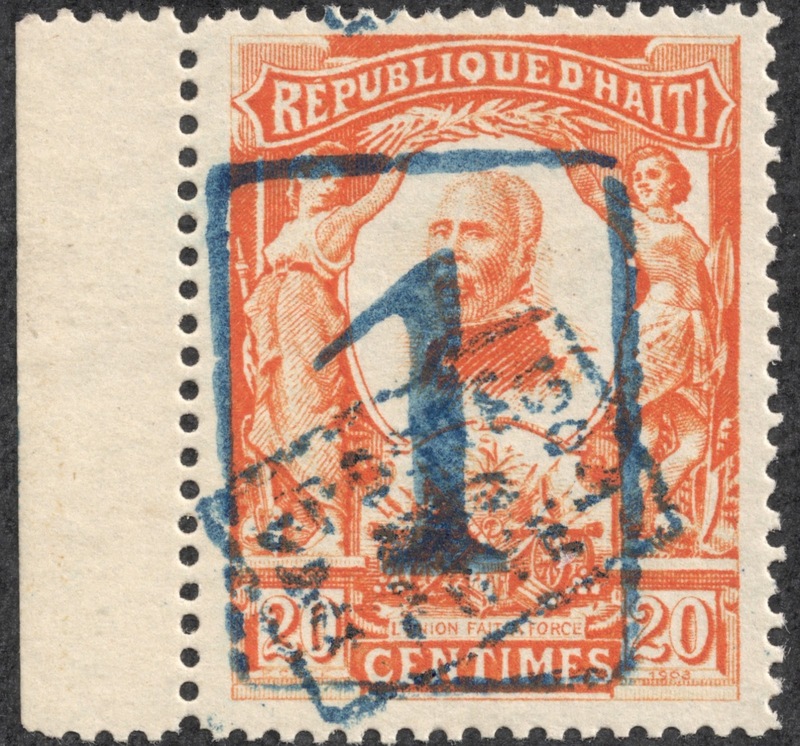 The reality is this stamp issue is out there among philatelists, and is common. Both Deep Blue (Steiner) and Big Blue provides spaces for the set. 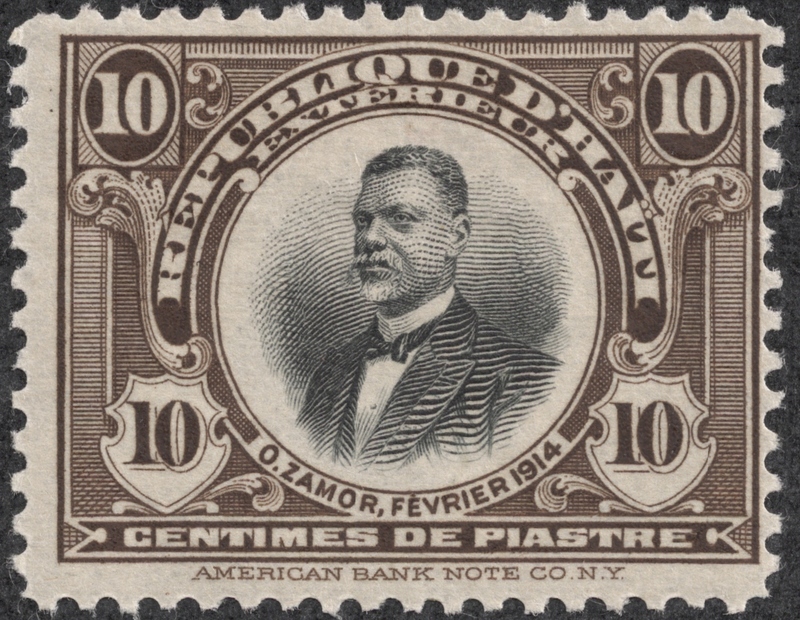 Oreste Zamor, the man who had the triumphal entry to Port-au-Prince on February 7, 1914, is portrayed on six denominations of the set. He only served until October, 1914, when he too was overthrown. The following year, he was assassinated on orders of President Vibrun Guillaume Sam. 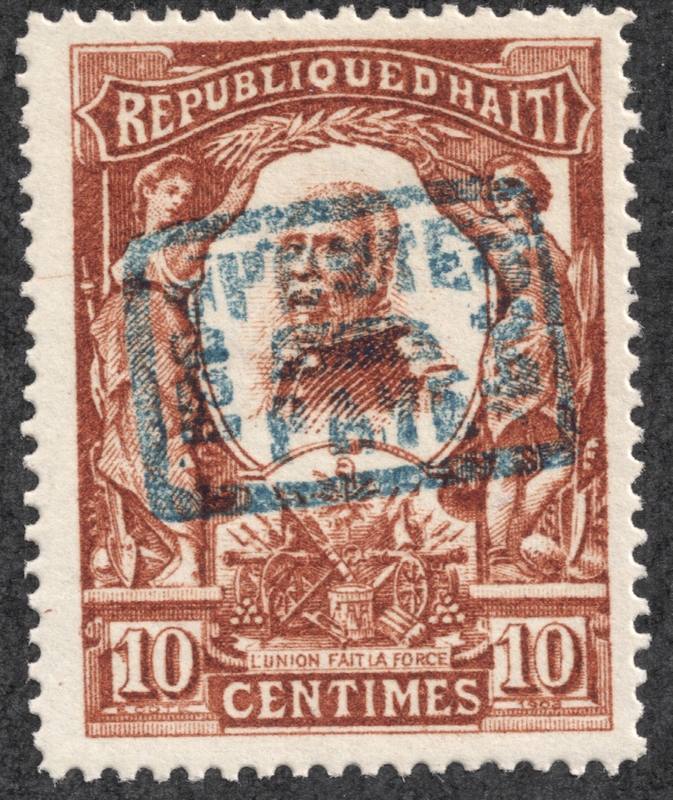 Also portrayed on one stamp is Tancrede Auguste, the man who succeeded Cincinnatus Leconte as president. Considering the turmoil occurring at the time (Presidents overthrown or assassinated, and the U.S occupation), it is not surprising to find many surcharged stamps.There were eight stamps (CV <$1-$2+ for seven of them) issued during 1915-16 with the handstamp surcharges as shown. 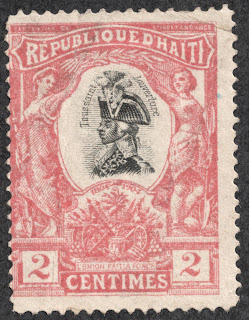 Above is an example of an overprinted stamp, then subsequently surcharged. 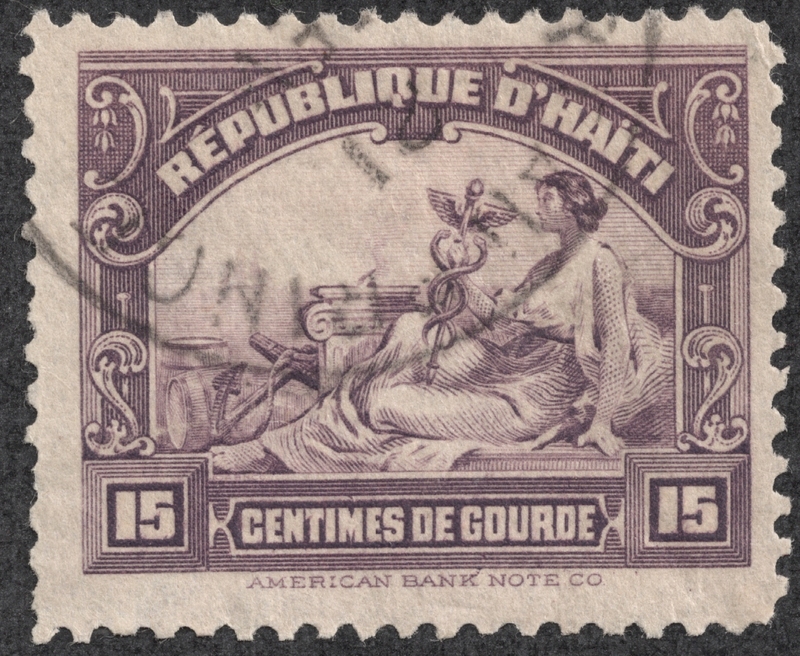 Between 1917-19, 59 stamps were handstamp surcharged in various colors. ! Of those, 45 are CV <$1. A treasure trove for both the specialist and the WW classical collector! 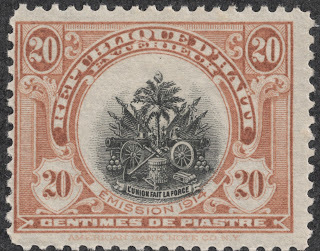 Above is an example of the many surcharged stamps issued during 1917-19. 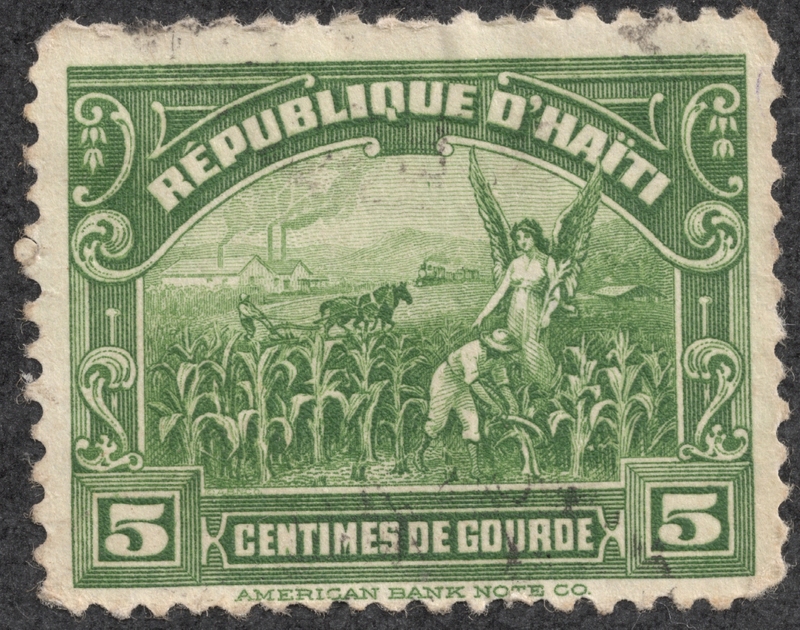 1920 Scott 311 5c green "Allegory of Agriculture"
Finally, in 1920, a non surcharged set was issued. 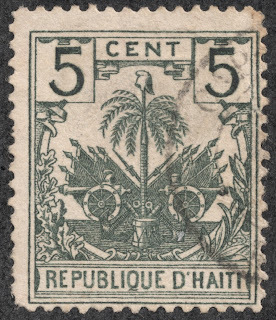 The five stamps in the set have a CV of <$1. Quite attractive. 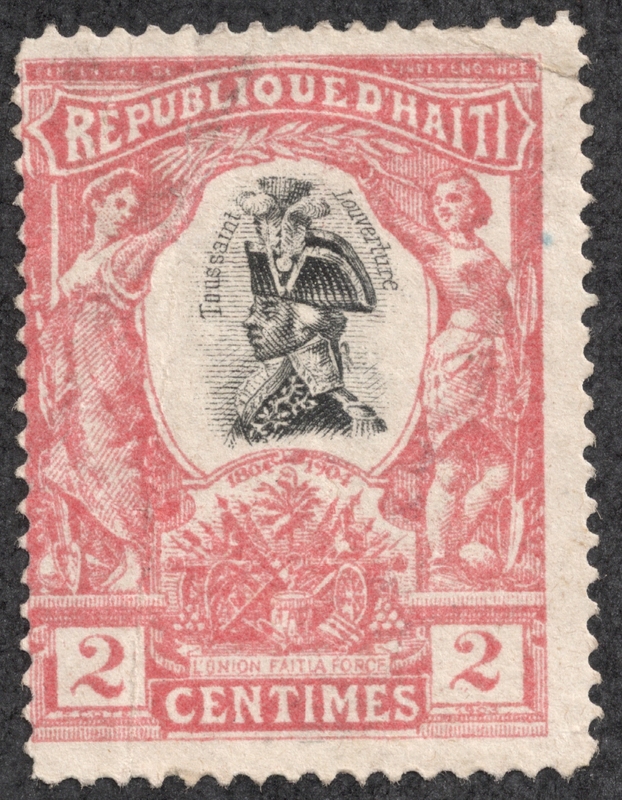 1924 Scott 316 10c carmine "Christophe's Citadel"
A five stamp set was issued in 1924 with a CV of <$1. President Louis J. Borno is portrayed on two stamps. 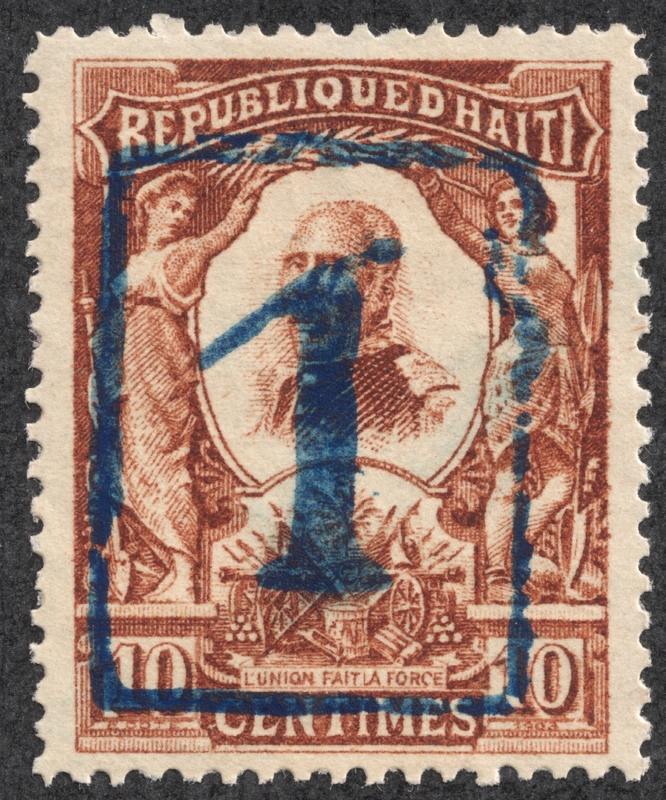 He served as President from 1922-1930 during the American occupation of Haiti. 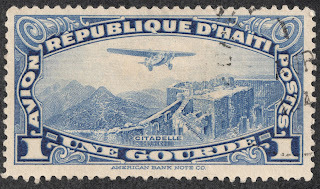 "Christophe's Citadel", shown on the stamp above, is a large mountaintop fortress in northern Haiti. 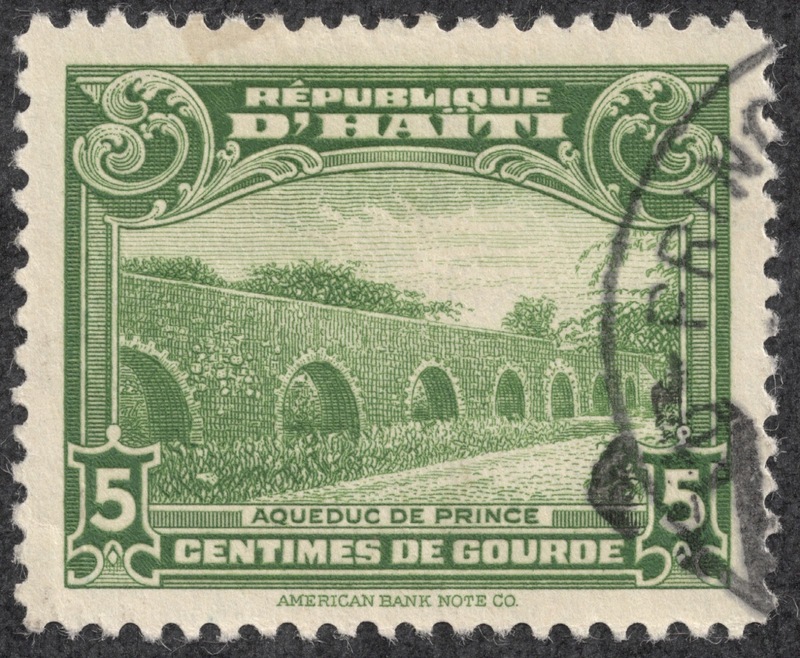 The stone fortress was built between 1805 and 1820 by 20,000 workers as protection against French hegemony by the now independent nation of Haiti. 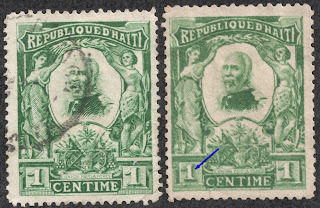 1931 Scott 322 5c deep green "Salomon and Vincent"
Sténio Joseph Vincent was President of Haiti from 1930 to 1941. He had campaigned in opposition to the American occupation of Haiti. The US Marines left in 1934. By the mid decade, though, he was considered to be one of the strongest pro-American supporters in the western hemisphere. 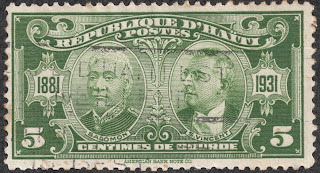 A nine stamp issue (CV <$1) was produced during 1933-40. These illustrate buildings and structures in Haiti. A rather attractive set. 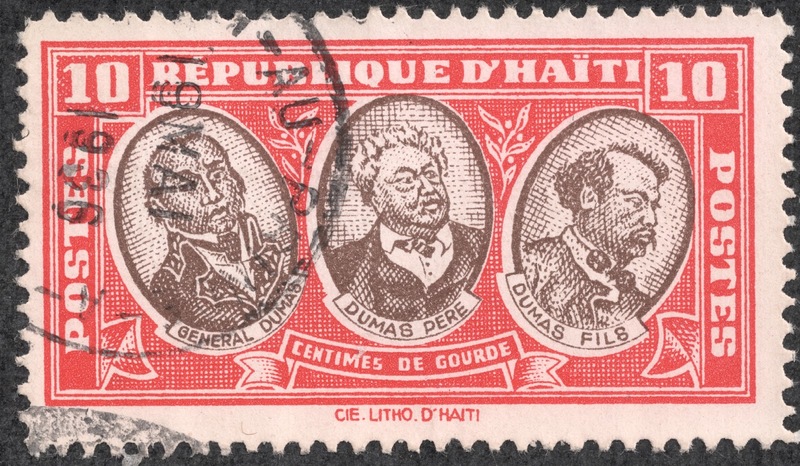 "Alexandre Dumas, His father and Son"
This two stamp set was issued to commemorate a visit of a delegation from France to Haiti. Alexandre Dumas was a French writer of historical novels of high adventure such as "The Three Musketeers". Dumas was the grandson of a French nobleman and a Haitian slave. Of interest, this stamp was lithographed locally. 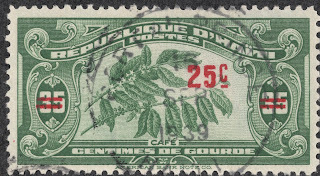 The last regular stamp for Haiti in the Scott Classic is this surcharged "Coffee beans and Flowers" stamp. 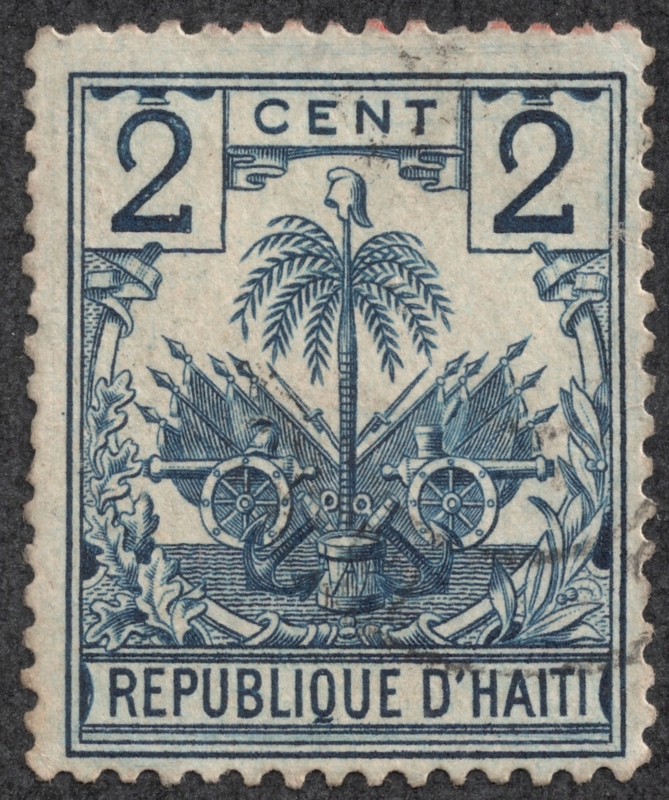 A beautiful stamp and a fitting end to the Haitian survey. The Deep Blue album (Steiner) has 25 pages for Haiti, and follows the Scott catalogue with spaces for all the major numbers. Of interest, Deep Blue does provide room for the 1914 10 stamp set that now has no "live" numbers in the current Scott catalogue. Since this set is common, and a part of Haitian history, I think that is a wise choice. Big Blue '69, on seven pages, has 188 spaces for regular, semi-postal, air post semi-postal, air post, and postage due categories. Coverage is 55%. The 1881 (Imperf), 1882 (perf), and 1886-87 (perf) Liberty Heads are put through a convoluted choice maze by Big Blue. There are three spaces. The first space shows "A1" design, and therefore 1 (imperf) or 7 (perf) can go there. The 1886 Scott 18 is ruled out because it is an "A3" design. The second "descriptive" space; either 2 or 19, but not 8 (color change: not eligible). The third space is a "blank" space, and I chose 3 or 9. But Scott 20 is an '87 issue, and is ruled out because of date specifications (1881-86) in BB. Five stamps are left out of BB with a $2-$3+ valuation. C'est la vie. 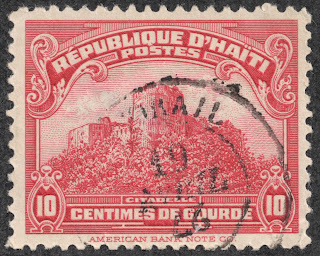 B) BB includes almost a full selection of inexpensive stamps from 1887-1904. Very nice! 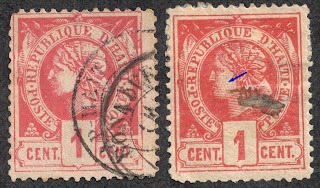 C) The 1906-07 six spaces often have 2-3 choices because of different colored surcharges. D) The 1914 thirteen space "handstamp" blank space choices is a dilemma for BB collectors, especially the first five spaces. BB shows a "horizontal" oriented handstamp in the second space ( which will govern the first five spaces), but only gives a "vertical" space format! The horizontal stamps with a horizontal handstamp will not fit! I have substituted a "vertical" oriented handstamp stamps to fit the "vertical" spaces. The "vertical" choices are 199,200,201, 172, or 173; although 174 and 175 could be considered also. If you want to "squeeze" in horizontally oriented stamps to fit the "horizontal" handstamp cut, then try 177,178,179,180, & 181. 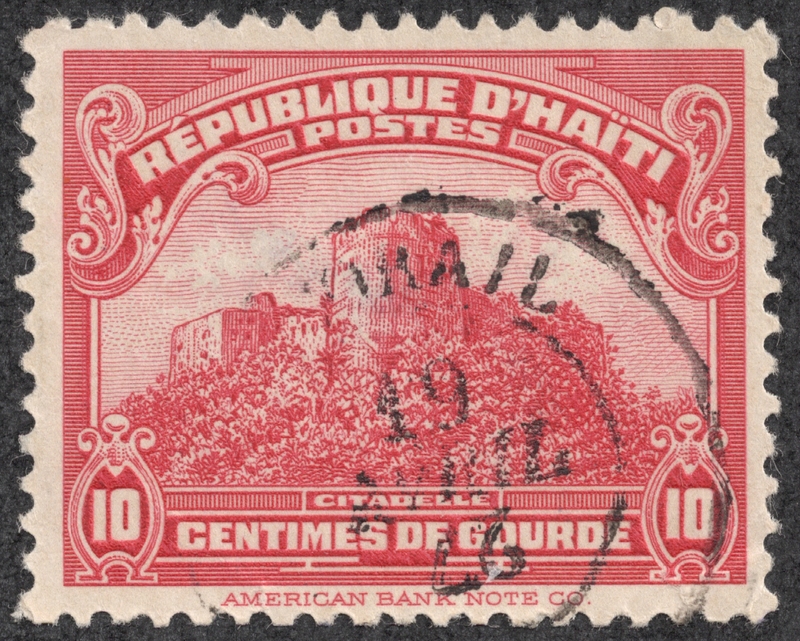 In 1914, a 10 stamp issue was produced, but a large quantity was stolen during transit. The stamps were never placed on sale at post offices according to Scott. The stamps are in the 1947 Scott catalogue (Scott 219,221,223,224,226,227,228,230,231,232), but the numbers are gone in the 2011 Scott Classic, although Scott does illustrate the designs and puts a value of $8+ for the set. One can see the first part of the 1915-16 set (Actually 1914) in the pic above. For the checklist, I have inserted the decommissioned Scott numbers. All "blank" thirteen space choices, based on various handstamps, there are a total of 32 stamps that could be put into these spaces. 24 stamps are <$1. 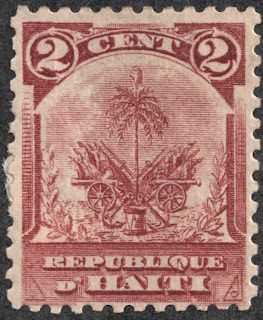 F) Although Haitian stamps are quite inexpensive, BB does have two Air Post Semi-postal and one regular Semi-postal spaces that are CV $20+. B) ( ) around a number indicates a blank space choice. There are also whole sections where blank space choices are put in. A comment is made in the checklist. C) Considerable discussion/comments are available before the checklist also. 1920 Scott 313 15c violet "Allegory of Commerce"
Very interesting country with a tendency for Presidents to not last long during the classical era. I certainly felt myself becoming immersed in the history as I reviewed the stamp issues. Frankly, I was not aware of the considerable involvement (read occupation) of the U.S. in Haiti's affairs. Note: Maps appear to be in the public domain. 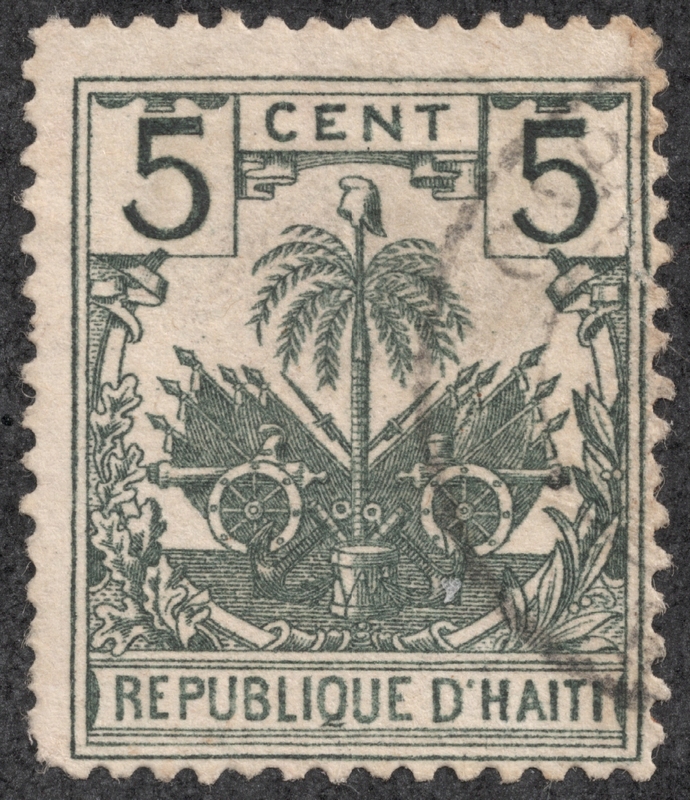 Haiti is a fascinating country for at least a couple of reasons -- the remarkable late 18th and early 19th century black uprising which became the first slave revolution to succeed on a large scale and which established, as you note, the first black republic in the Americas. 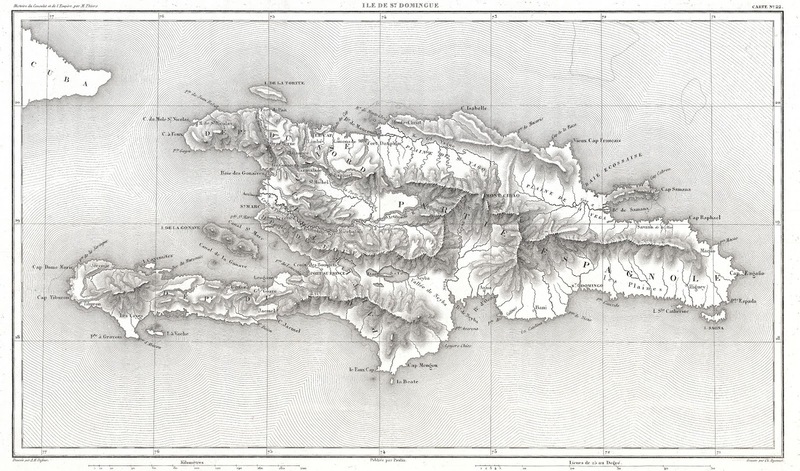 And the fact that the U.S. was repeatedly involved in Haiti during the early 20th century a hundred years later. The U.S. had largely ignored Haiti after its revolution, not wanting to encourage slave uprisings because we were ourselves a slave society until 1865. So Haiti was left to fester in poverty. Then as Haiti struggled through one leader after another, we continued to play little role until Marines were landed a number of times in the early 20th century to establish order. A little later for that! We did the same in the Dominican Republic next door. It was a combination of American "gunboat diplomacy" and "dollar diplomacy" as U.S. investments were also made. Meanwhile, the Haitian people remained in poverty. 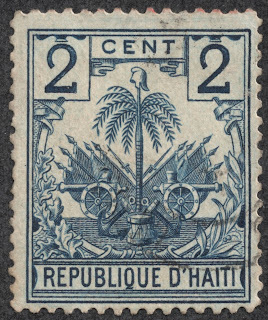 The stamps are fascinating with all the revolutionary symbols, the various presidents who came and went (some very good, some very bad), the French historical connections, the U.S. role in Haiti, the many forgeries. You almost couldn't ask for more. 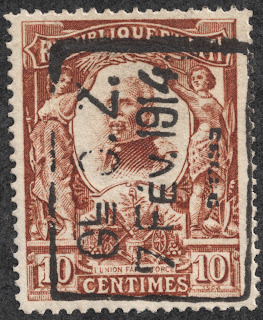 I know reprinting stamps from old plates is a type of "forgery" but it hardly seems like one. It's the same plate even if the paper or ink is different. Redrawing the image of the stamp is clearly a forgery. Reprints, to my mind, ought to be treated a little differently though and I'd be almost as happy with one of them as the "official" stamp. And the forgeries are very interesting to have, as well. It's hard to see how much money anyone could make from forgeries of low-value stamps, though, and I've never quite understood the reason for doing so. Thanks for the insightful comments, Drew. Outright stamp forgeries I like, because it can be a great game spotting the telltale marks of a forgery. Reprints I find myself on shakier ground if the perforations, paper or ink are not obvious. Glad you found it worthwhile Patrick! Are you selling them? If so, how much? I would really love the Alexandre Petion and Dessalines one. Any one really dealing with the 4-5 original founding fathers of Haiti. 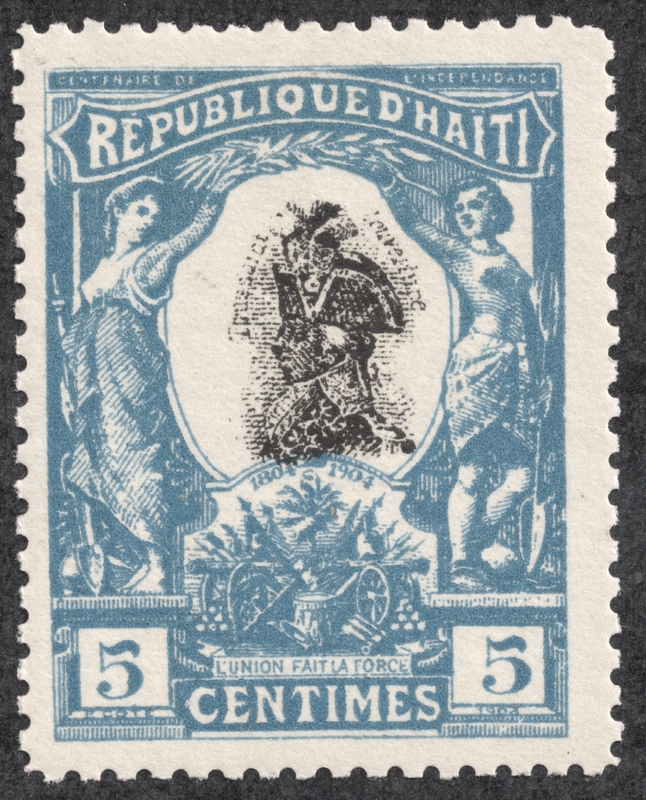 Haiti stamps are generally inexpensive, and you could pick up stamps with the "founding fathers" fairly easily at ebay or other sources. Goof luck! 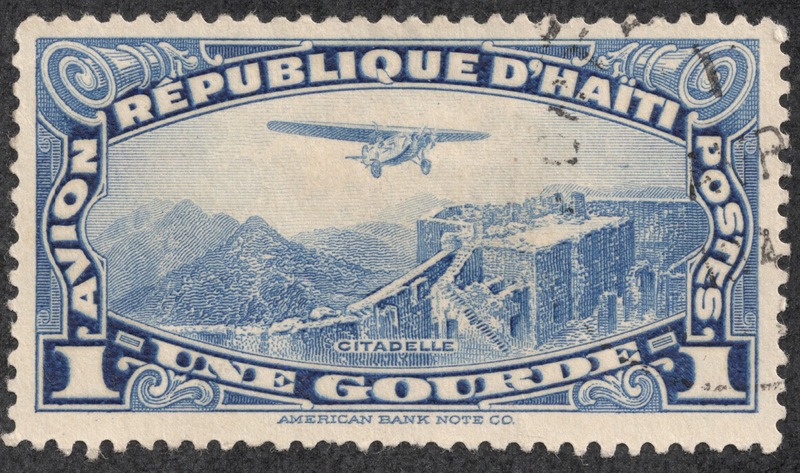 The above stamp, issued in 1935, was in blue and chocolate. Ray - Nice story- thanks for sharing.